Energy efficiency is not just for older homes. Recent home energy evaluation data shows that a home’s energy efficiency is not directly correlated to its age. Even if your home is relatively new, you could be saving valuable energy and money with some simple steps. 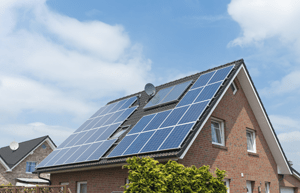 Solar panels, or photovoltaic cells, are one of the best ways to increase the efficiency of energy in your home and lower your electricity expenses. More and more homeowners are looking to make the switch to clean energy by installing solar systems on their roofs, thanks to low prices that continue to get lower every month. When the system production exceeds the electricity used, the excess energy automatically flows through the electric meter to the utility grid allowing you to receive credits on your electric bill. Get a Customized Solar Quote for Free Based on Your Home’s Architecture and Energy Needs. Replacing old, leaky windows with higher-efficiency models can also make your home greener and more energy efficient. Storm windows can be a lower-cost alternative to a full-blown window replacement project. If your interior windows are in good shape, then installing storm windows is a quick way to increase your energy efficiency without going through the expense and the mess of ripping out your current windows. Research new window options and prices that work best for your home. Your heating and cooling systems are by far the most expensive parts of your utility bills. Buy an HVAC system that is efficient. Be sure to insulate the ducts and seal up any leaks. Insulating your walls and the attic and updating your windows will keep you cooler in the summer and warmer in the winter at a lower cost to you.